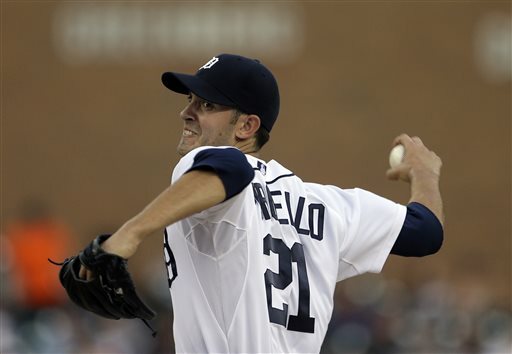 The Oakland Press Blogs: Open Book: A Sports Blog: Is the Detroit Tigers' Big Four really a Big 5? Is the Detroit Tigers' Big Four really a Big 5? It's difficult to dispute the Tigers have the best starting pitching rotation in baseball. Justin Verlander is arguably the best starter of his generation. Max Scherzer is an enormous and emerging talent. Doug Fister has been a wonder since the Tigers' traded for him in 2011, developing a tremendous breaking ball and a swing-back fastball, which has become his trademark. Anibal Sanchez, apparently, has developed the consistency he had been lacking with the Marlins. And then there is Rick Porcello. He was brilliant Tuesday night vs. the Pirates. Was it a sign he is coming of age after a disappointing start this season? Porcello has been an enigma. He has accomplished a lot already in his career considering he is just 24. He already has 50 victories. His career ERA (4.61) and WHIP 1.407) are high, though. Porcello should, theoretically, be better. He has one of the best two-seam (sinking) fastballs in baseball and can effectively change the eye level of hitters with a 95 mph four-seam (straight) fastball. He has the makings of a good breaking ball, too, and has displayed solid competitive character in big games for the Tigers. But there have been too many poor outings considering his talent combined with experience level. Yet, it's difficult to come to any conclusions given his age. Verlander came into the major leagues and excelled from his first full season. It was more of a struggle for Scherzer, Fister and Sanchez. At 22, Sanchez was 10-3 as a rookie with a low ERA, but struggled the next couple years. At 24, he was 2-5 with a 5.57 ERA for the Marlins. His overall career record at that point was 14-9 with a 3.85 ERA and a WHIP over 1.3. At 24, Scherzer was 9-15 with a 3.85 ERA - all with Arizona in the National League where there is no DH. His ERA has been exactly the same - 3.85 - in the AL. His WHIP was over 1.3 at 24. Fister had yet to advance past Double-A in the minor leagues. At age 24, he was 6-14 with a 5.43 ERA and a WHIP of nearly 1.5 at Double-A West Tennessee in the Southern League. There has been a lot of preaching of patience regarding Porcello. Such a sentiment, based on the rest of the Tigers' starting pitching rotation, is well founded.